It looks like spring in the Nicola Valley has finally arrived. The last few days the almost balmy weather made short work of the ice on the lakes, with exception of a few lakes at higher elevations the ice is all gone. If the warm weather keeps up these higher up lakes too will soon be ice free. Fishermen, including me, have been waiting for what seems like a very to long time. With the spring arriving and the ice off the lakes it is time to dig out the fishing tackle box and put new line on the reel. My mind is drifting between going fishing and turkey hunting. The bears are still hibernating at the higher elevations where I hunt them, which is just as well otherwise I would be in a real dilemma with all the choices the spring offers to the outdoors person. 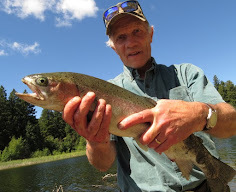 The other day I drove by the Nicola Lake - which is only a few driving minutes from our house - and darn it if I didn’t see a few rainbow trout, could have been kokanee’s too, jump. Arriving back home I hauled my fishing gear out of the winter storage, washed the boat and got everything else ready for the first fishing trip of the year. 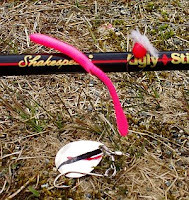 In the spring trolling with small flashy spoons or weeding bands works great and so do pink and red plastic worms. Use a rod with a sensitive tip, as bites will be very light. Shore fishing on the Nicola Lake can be good too with a good old red and white ball bobber you will be able to reach further out. As lures go I always make sure I have a few Rapala’s in different colors and sizes in my lure box as back up. If all else fails out comes a Rapala and I am almost guaranteed to get action with these lures. 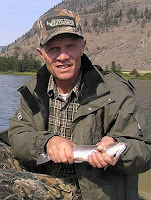 I am not a flyfisher but I have seen the first chironomids appear and that is the time, so flyfishers tell me, to make sure your fly box if sufficiently stocked with that type of flies. Black leeches with red flash, so I am told by one source, get bites too. I am ready to go fishing and will head out with my boat right after I return from my turkey hunt.